This is the 3rd week of the Daily Getaways promotion so let’s see if there are any good offers! 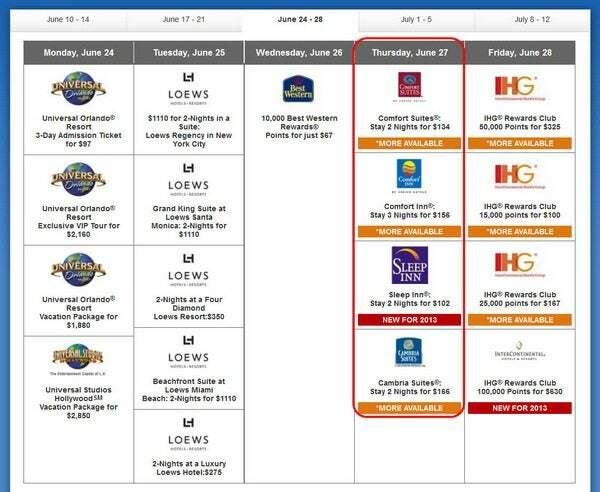 The best deal is on Thursday, June 27, 2013 for buying 40,000 Choice hotel points for $166. You can transfer 40,000 Choice hotel points to 12,000 Southwest points or $200 in Southwest travel (so you make $34) and 12,000 points towards the Southwest Companion Pass! 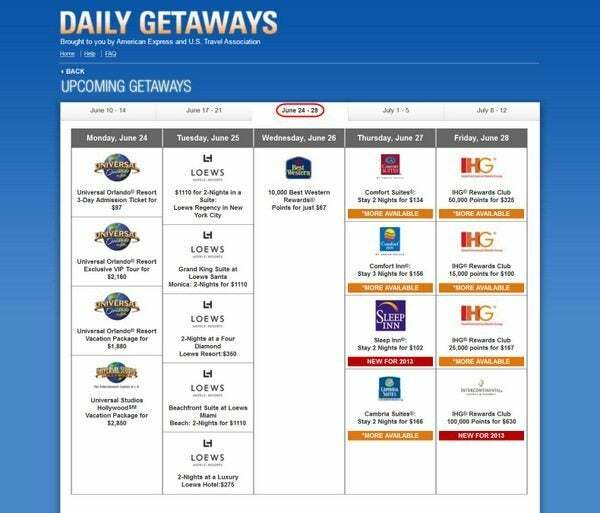 There will be a new deal on the Daily Getaways website every weekday at 1:00 pm Eastern Time up to July 12, 2013. 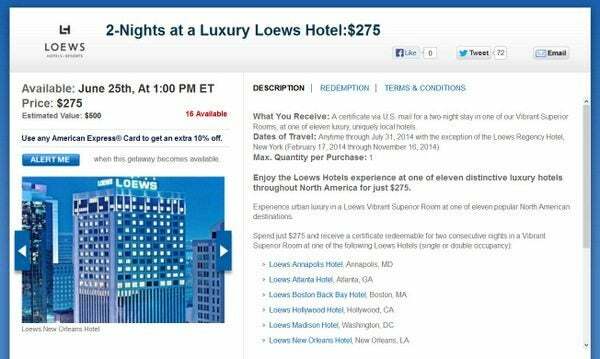 2 nights in a Loews hotel for $275 is a great deal if your travel takes you to a city listed below. You get the certificate via US mail, and it is valid up to July 31, 2014 for a two-night stay in a Vibrant Superior room. The certificate is valid only in the following hotels. The certificate is also valid for the Loews Regency Hotel in New York, once it opens, between February 17, 2014 and November 16, 2014. And it is hard to find a room in New York City for less than $138 per night. On June 26th, 2013 Best Western is selling 10,000 points for $67, up to a maximum of 5 sets per person (50,000 points). There is an extra 10% discount if you pay with an American Express card. Choice Privileges includes Ascend Collection, Cambria Suites, Clarion, Comfort Inn, Comfort Suites, EconoLodge, MainStay Suites, Quality Inn, Rodeway Inn, Sleep Inn, and Suburban brand hotels. 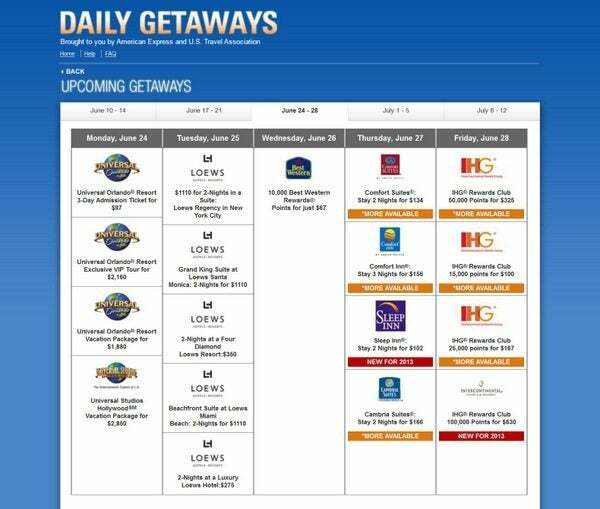 Daily Getaways is featuring the following offers for Choice Privileges points, ranging from 0.42 to 0.51 cents per point. There is an extra 10% discount if you pay with an American Express card. $134 for 32,000 Choice Hotel Points! Choice hotels aren’t the fanciest, but they have a LOTS of hotels, over 1,500 of which cost 8,000 or fewer points per night. The award chart for Choice hotels is here, and their award nights start at 6,000 points, or $25 a night if you buy points at 0.42 cents per point and go up to 35,000 points or $147 a night. So you can use Choice hotels to book inexpensive hotel rooms in expensive cities like London, Paris, and Rome. In fact, Emily and I used them when staying in Sao Paulo, Brazil a few years ago. Our room was large, clean, comfortable and just around the corner from Rua Oscar Freire. Just like Best Western and Priority Club, Choice hotels points can generally be transferred to their airline partners, generally at a 1:5 ratio. The best value, though, is to transfer Choice Privileges points to Southwest points at a 1.8 to 6 ratio. Points transferred from Choice hotels counts toward the Southwest Companion Pass which is my favorite airline perk. 40,000 Choice points for $166 gets you 12,000 Southwest points toward the Southwest Companion Pass. You can redeem 12,000 Southwest points for 1.67 cents per point towards Wanna Get Away fares, so they are worth ~$200 (12,000 points X 1.67 cents per point). The net result is that buying $166 in Choice hotel points gets you $200 in Southwest travel and 12,000 points towards the Southwest Companion Pass! 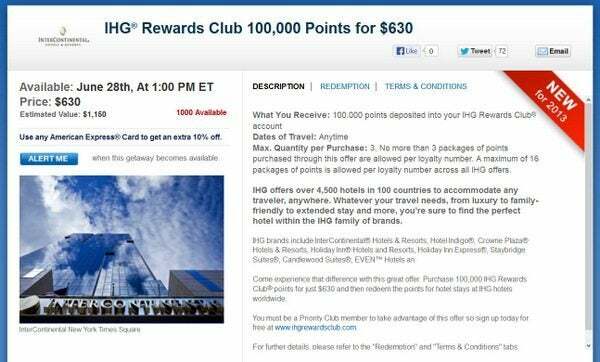 In addition to Best Western, Priority Club (soon to be known as IHG Rewards) is selling four different points packages on Friday, June 28, 2013. Rates vary from 0.63 to 0.67 cents per point, with the best rate for purchasing 100,000 Priority Club points. There is an extra 10% discount if you pay with an American Express card.Priority Club hotels include Candlewood Suites, Crowne Plaza, Holiday Inn, Holiday Inn Express, Hotel Indigo, Intercontinental Hotels & Resorts, and Staybridge Suites brand hotels. You can purchase up to 3 packages of points through the Priority Club Daily Getaways offer, for a maximum haul of 300,000 points. Priority Club’s award chart can be found here, and award nights start as low as 5,000 points each with PointBreaks. However, at some specific hotels, such as Intercontinental and Crowne Plaza hotels in large cities, you may be better off during peak travel times by purchasing the points for an award. Priority Club points can be transferred to a number of different airlines at the same 1:5 ratio that Best Western points transfer. This is not a good deal and is expensive. For example, when searching on a random date I found the Hotel Indigo in New York City for $345 or ~$400 with tax. 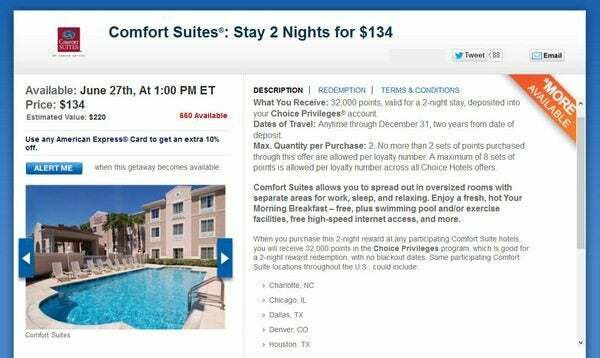 Buying 50,000 points for $325 and booking the same room for 45,000 points will save you at least $75. This is just one example, so do the math for your specific situation. There are some good Daily Getaways in week 3, but you’ve got to act quickly because they get sold out within a few minutes! And don’t forget to use an American Express card for an extra 10% off. Again, make sure to do the math to see if taking part in the Daily Getaway makes sense for you. Just because something is discounted doesn’t mean that it is worth buying! Hey D…No specific use of the PC points in mind for the next 8-10 months but will be planning a big trip to Asia next summer…are you a buyer of the PC points now? I think if P+C trick at 0.7 stays, this isn’t a big enough discount to lock in that far ahead. Do you agree? @Jeremy – I agree. No point locking in your money now, when your trip is 8 months away. That said, if you know you will make the trip, and if it is cheaper to buy points, you could do it now, but you lose flexibility if you buy now. Not quite clear to me about the Choice Privileges rewards: Website said 20,000 Points for $102 in sleep Inn. But you mean I actually am able to redeem the purchased points in non-sleep inn hotel, as long as it is Choice Privileges hotel? like Clarion Inn? @Mo – You can buy 2 sets of each package and there are 4 packages for sale. @Joey – You get Choice hotel points in your account which you can use for anything you want. @Million Mile Secrets: what you mean by “buy unto 8 potential packages.”? According to the terms, we can only buy 2 sets (80,000 pt? ), then convert to 24,000 RR pts? I wish I did my math right. On Choice website it states that a person can only have 20,000 points put in their account despite if bought or received as a gift. Since this is a promo do you know if that statement does not count? Instead of one, could I buy two Choice promos then transfer to fulfill my CP status? @Ld – The terms of the promotion say that you can buy up to 2 sets of each package, so you could buy unto 8 potential packages. I booked this place for January 2014 so I can’t comment on the actual rooms, but the pictures and reviews look very nice. @Airgypsy – That would certainly work (assuming that hotel transfers still count towards the Southwest Companion Pass). You can transfer the points any time before expiration. @Nandan Dasgupta – It depends on your goals. But if you’re looking for 1 card, it is hard to beat the Chase Sapphire Preferred. @Jasmine – I agree. Sometimes all you need is a place to sleep.